I survived midterms, and with those tests, two of my classes actually ended. Food Safety class prepared me for a successful ServSafe Food Safety Manager exam. It’s good for five years, and allows me to take a management role in any restaurant nationwide. Not that anyone would give me such a job considering I have now nine weeks of culinary school and four days back-of-the-house experience under my belt, but the key is the five years. My Food Safety class has become Nutrition and the other class, Product Knowledge, has become Gastronomy. Both extremely fascinating, but Gastronomy more so. Last week, we started the conversation with some very elementary, but little thought of topics, such as ‘what is cooking?’ and ‘why do we cook?’ We got into a long classroom discussion about the application of heat, seasoning, chopping, marinading, and how, at its most fundamental level, cooking is the transformation of food into energy and nutrients. Somehow we even ended up talking about the 50 ways to cook and eat carrots. Of course in these discussions, there are no wrong answers. I agree with these assessments and everything everyone said was valid, but somewhere in there I tuned out the back and forth between my classmates and the teacher. I don’t cook to eat. I’m not good at communicating my feelings, and neither is anyone in my family. I’m not sure how my sister and brother knew they were loved, or how they felt it, but for me, it was through food. This is a surprising statement because no one in my family is particularly passionate about food. Nobody’s careers have even remotely touched food in anyway. Unlike many of my classmates, I didn’t grow up in a restaurant or on a farm. My parents divorced before I had self-awareness, so my memories are with them separately, and for some reason they are all about food. This is the only reason I can possibly point to for why I’m so into food. I felt their love for me through food. Crystal clear childhood memories of when my parents still lived together; me and my dad on the back patio in front of the grill. It’s summer, after work, sun is going down, humid as hell. Thankfully, I wasn’t quite tall enough to be towering over the grill so I escaped some of the additional heat. On the grill were Oscar Meyers, and if I was lucky, the kind with the cheese piped through the middle. Processed foods in those days were so simple and elegant. Not like today. Case in point: Jimmy Dean Chocolate Chip Pancakes and Sausage on a stick. I can’t even come up with anything to say about that so I’m moving on. Back to the dogs. They were burnt to black, crispy perfection on all sides. Toasted bun with sweet as candy, green as neon relish. But the best part was standing next to my dad, grill utensil in hand, and every so often I’d get a sip from that cold Bud can in the faded cosy. With my mom, it was all about Christmas cookies, and ‘Merry Christmas Johnny Mathis.’ We’d start out on a Saturday and bake all damn day. When it got dark out, I remember the twinkling multi-colored Christmas lights from the fake tree in the front window when I’d go to flip the record over. In our house, the fake tree went up right after Thanksgiving. Oh, we’d still buy a real tree – from a farm right down the road (see Fierce Jersey Pride post). Walking through the rows of fresh cut trees smelled like Christmas. To this day if I get around too much rosemary, those tree-picking memories come flooding back – Christmas at home in Jersey. We’d bring that fresh tree home, and care for it in the cold garage until Christmas Eve when we’d bring it out and decorate it together. The cookie baking with mom was epic. Spritz cookies from an ancient cookie press gun from the 1960s, I think – anyway, it was puke green so I’m guessing ’60’s. It jammed a lot, but we pressed out zillions of shapes and sprinkled food coloring-dyed sugar on top. Then there was Peanut Butter Balls. 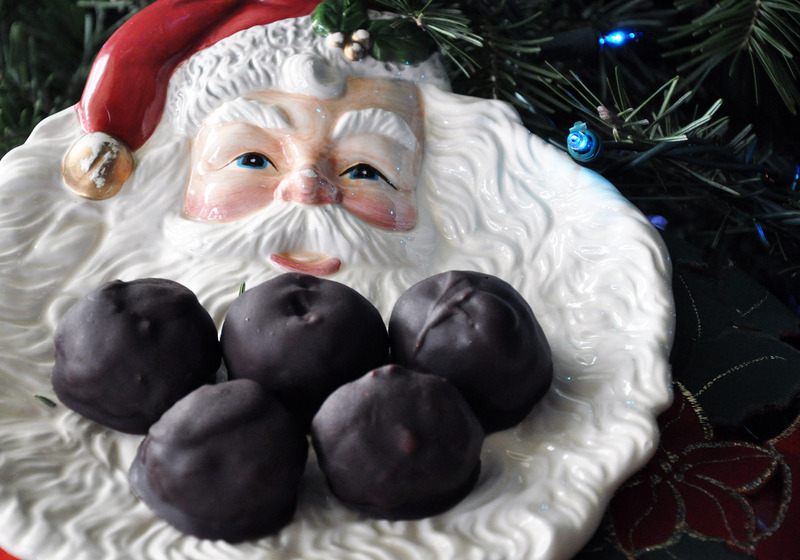 These no-bake guys were just peanut butter, powdered sugar, butter and Rice Krispies mixed together, rolled into a ball, then dipped into melted chocolate and frozen. When you bit in, the chocolate layer pleasantly cracked and froze your mouth at the same time. Oh gosh, we must have had a dozen more kinds of cookies and bars going – too many to remember – but we were careful to lay a big plate out for Santa Claus on Christmas Eve after the tree decorating. And P.S. I still love Johnny Mathis and have seen him in concert a bunch of times – makes me feel so young! When holidays or vacation rolled around, my dad always wanted to let loose and gave me money for candy, and bought huge gallon tubs of ice cream and boxes of junk cereal. My mom, on the other hand, was all about no preservatives and healthy foods, which in retrospect, was pretty cool for the ’80’s. Somehow, though, this didn’t seem to rub off one bit on my sister or brother. When the candy came in, my mom always solicited me: candy for shiny silver dollars. I bargained and gave up some of it, but never all. Candy high was the only high back then. So that’s why I cook – to show love – and that’s why I’m deliriously happy in culinary school. Sure my pants are still on fire, but I love it! Cooking is how I communicate with people I care about. I love you if I cook with you and/or for you. Sorry if I don’t say it often enough – that’s part genetics and part my childhood environment – but now you know family and friends! This entry was posted in Eat, Love. Bookmark the permalink.